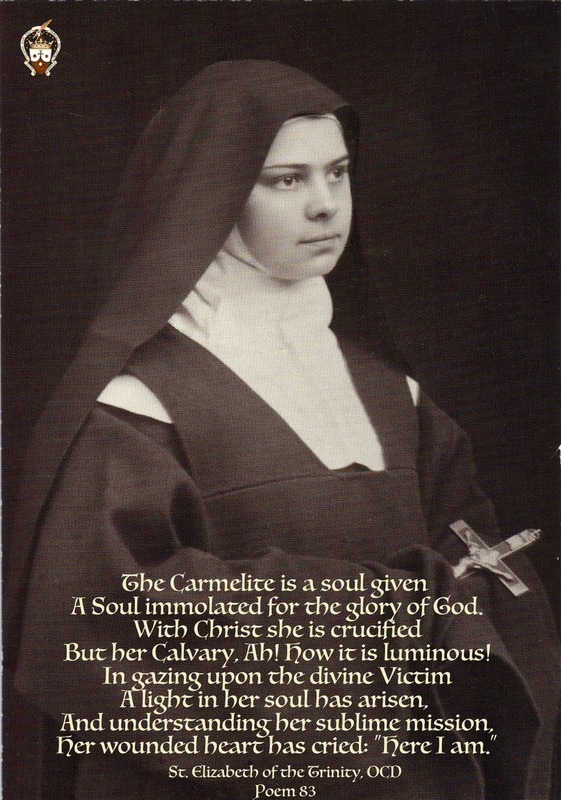 A very Happy Feast of St. Elizabeth of the Trinity! In this longer post we wanted to share a little about Carmel’s newest saint for those who don’t know her and then also share an except from one of her beautiful letters. “Laudem Gloriae”! Saint Elizabeth was born as Elizabeth Catez on July 18, 1880, in a military camp near Bourges. Her mother gave birth just at the end of the Holy Sacrifice of the Mass which her father, Captain Catez, had arranged to have offered for his wife and child, whom he feared he was losing during a difficult delivery. At the age of two, she was taken to Dijon where her father had been transferred and there St. Elizabeth had the joy of gaining a little sister when Marguerite was born on February 20, 1883. St. Elizabeth was difficult and temperamental as a child and very hard to manage. Her mother persevered in loving yet strict discipline. It was Jesus, however, who provided in her first sacramental confession the grace she needed to grow. After that great event which profoundly affected the saint her efforts at self-control began to bear fruit. That evening her mother took her to the Carmel and the Prioress told her that “Elizabeth” meant “the house of God.” The meaning of her name took root in her soul. In time, the Mystery of the Divine Indwelling became the central theme of her entire spiritual life. Her entrance into Carmel was delayed for quite some time because of the great reluctance of her widowed mother, for she did not wish to give up her beloved daughter. Finally, St. Elizabeth was permitted to enter at the age of twenty-one on August 2, 1901. On December 8, 1901, she received the habit, and she made her profession on the feast of the Epiphany, January 11, 1903. In early 1903, she began to show the first signs of Addison’s disease. In Lent of 1906 she became so ill that she was moved to the infirmary. St. Elizabeth was canonized on 16 October 2016. The following is an excerpt from Letter 185 to l’Abbé Chevignard dated 28 Nov 1903. May we all grow in the loving awareness of and be transformed in Love by the indwelling of the Most Holy Trinity! Happy Feast! 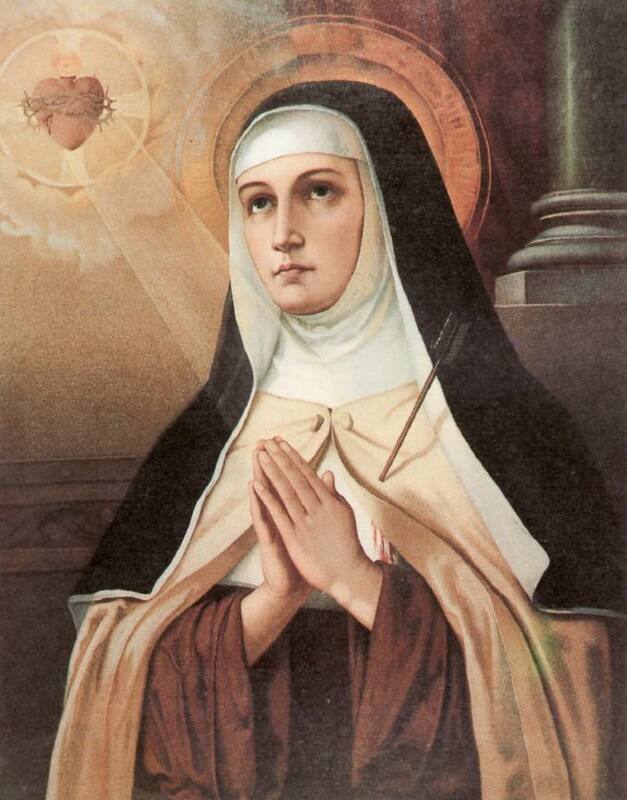 St. Teresa of Avila (1515–1582), has fascinated me for years. I often feel unworthy in saying that I follow her apostolic, contemplative zeal and desire for God. And yet, her powerful witness has educated me through the years. She was a strong and important female woman of the Church. St. Teresa of Avila was named the first female Doctor of the Church. Teresa’s own history reveals her experience and motivations in the monastic life when she speaks of a mediocre prayer life, lax discipline and a loss of zeal for redemptive penance caused by too much socialization with visitors. The Lord in His infinite Wisdom called Teresa to give Him her heart and a desire to live differently through an intense experience of prayer experience to renounce worldly attachments and enter deeper into a life of prayer. An experience, not a discourse, moved her to making this a way of life and a teaching. It is reported that she was being encouraged by a mystical vision of her place in hell if she was unfaithful to God’s graces. The mystical life of contemplation became a source of trouble for Teresa as many didn’t understand the new horizons she had embraced. What she wanted was to reform her own life for the sake of the Kingdom. How much can we learn from her on this score? Too often we give into sin and mediocrity, we give ourselves “a pass” to excuse us from the right path, and we settle for gravel instead of silver and gold. Read her works the Interior Castle and The Way of Perfection. Pick up a good biography. Ask Saint Teresa of Avila for intercession before the Throne of Grace. The Latin Church observes the liturgical memorial of St. Teresa Benedicta of the Cross, known in history and professionally as Edith Stein. A woman of great import for us today. Stein was born a Jew and was killed at Auschwitz because she was a Jew. She was a brilliant philosopher, studying phenomenology with Husserl. One of her academic accomplishments was making a translation into German John Henry Newman’s works, which the young Ratzinger brothers read at seminary after the war. After studies and a period of teaching and research, Stein became a Carmelite nun because she read the life of St. Teresa of Avila. Leaving Germany she fled with her sisters to the Netherlands. 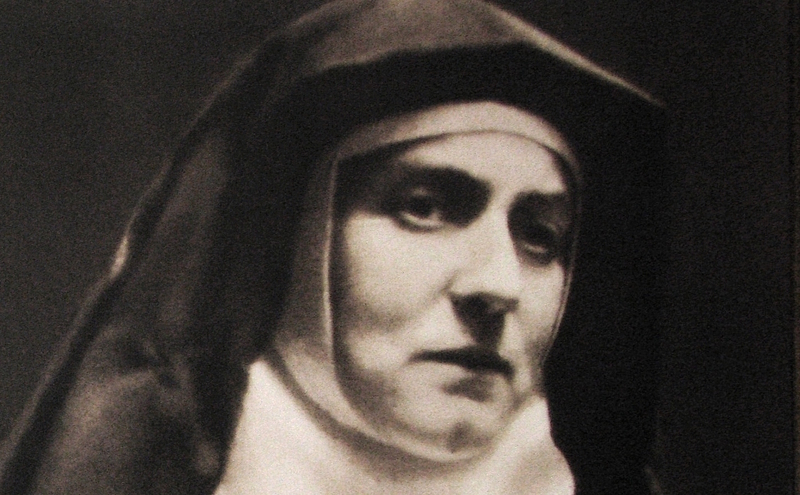 Ora pro nobis, on this your feast, St. Teresa Benedicta of the Cross. Saint Teresa Benedicta of the Cross (in history she is known as Edith Stein). The Church honors her with the title of Virgin and Martyr due to her vocation as a nun and one killed for belief in Christian faith. Stein was born on October 12, 1891, in Breslau, Poland. Her family was Jewish. By 1922, after reading the saints, in particular, Saint Teresa of Avila, and on matters in the Catholic faith, she was baptized at the Cologne Cathedral. Eleven years later she entered the Carmelite Order in Cologne before being sent to the Carmel in Echt, Holland. With her sister Rose, Teresa was arrested and sent to the concentration camp at Auschwitz. There she died in the gas chambers of Auschwitz in 1942 at the age of fifty-one. 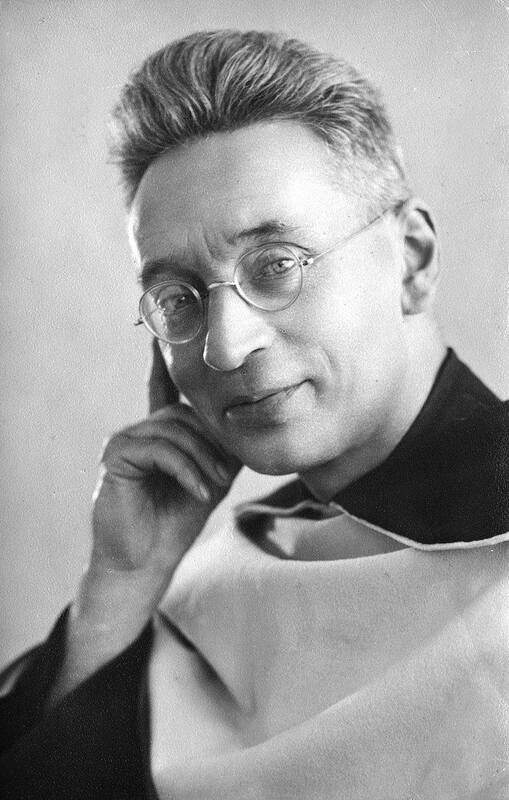 Stein was beatified in 1987 and canonized on October 11, 1998. It is said that she made a claim about Husserl that “Whoever seeks truth seeks God, whether he knows it or not.” Professor Husserl was not one to speak about his religious faith because he wanted to maintain a separation between faith and reason. Yet, we know from experience, that faith and reason go hand-in-hand. Catholics ought to take a lesson here: a person who claims Christian faith faith can not be diffident reading the same. One can say with a degree of certainty that Stein’s philosophical research was one of a constant quest for God. Saint Teresa Benedicta’s witness is that whoever seeks truth through philosophy seeks God, because God is Truth. We therefore hold that that whoever seeks truth is, in fact, seeking God. There is a primacy of faith and reason in the Catholic mind.